Whether you’re planning a major renovation or just installing new windows, your project’s success depends on finding qualified home improvement contractors in Phoenix. Because your home is your most valuable financial asset, you need to be especially careful when selecting a company to work on it. A good way to find a reliable contractor is to ask around and get input from others who have had work done. Then, get detailed estimates from several home improvement contractors in Phoenix. Make sure you select the company that provides the best service and can back it up with solid references and third-party endorsements. Don’t be persuaded by the lowest bid; you might end up paying more in the long run if you haven’t started with the right contractor in the first place. How long has the contractor been in business? You want to work with a well-established company that checks out with all appropriate sources. Determine if the contractor has unresolved complaints. If so, ask for an explanation of the circumstances that lead to the complaint and what the contractor is doing to resolve it. Just like customer complaints may be a red flag, don’t assume a clean record means you’re good to go with a contractor. Some customers may not have taken the time to file a complaint. So, make sure you don’t stop your evaluation with checking complaint status. 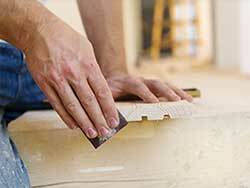 Are your short-listed home improvement contractors in Phoenix licensed? First, you need to learn how your particular state handles licensing. In other words, what requirements are in place for the type of contractor you expect to use and the type of work you’ll have done. Also, check with municipalities and local authorities for additional requirements. Then, make sure prospective contractors comply with these things as well. Ask to view licenses to make sure they’re current. How many projects like yours have the home improvement contractors in Phoenix completed? Don’t stop at having a contractor tell you about previous projects. Ask for a list and check them out yourself. What type of permitting is required for your project? Just like contractor licensing, make sure you understand permitting requirements for your specific project. What you may think doesn’t require a permit actually might. Most state and county building authorities require permits for even simple projects. If you select competent home improvement contractors in Phoenix, they will handle the permitting of your project for you. They’ll have all the necessary permits in place before work begins. If the contractor expects you to get the permits, be careful. It may be an indication the contractor isn’t licensed. What type of references doe the home improvement contractors in Phoenix provide? Any qualified contractor should be able to give you an ample list of satisfied customer with completed projects similar to yours. You should have contact information for these references so you can get their feedback directly. When you contact references, ask when the project was completed and if you can see it. You should also make arrangements to visit jobs in progress. Will subcontractors be used on your project? If home improvement contractors in Phoenix expect to use any subcontractors, you need to know exactly who will be working on your home. You need to verify their licensing and insurance as well to protect yourself. You should ask subcontractors if they’ve been paid promptly by the contractor. If they have a history of unpaid or late payments, you risk having a mechanic’s lien placed on your home in the event the contractor fails to pay them for your project. This means the subcontractors can go to court to use your home for paying their unpaid claims. Protecting yourself is your primary concern when working with home improvement contractors in Phoenix. What insurance does your contractor have in place. For adequate coverage, home improvement contractors need personal liability, worker’s compensation and property damage coverages. It’s important to ask for copies of the contractor’s insurance certificates and verify they’re current. If a contractor doesn’t have the proper coverage, you will be liable for injuries and damages that occur during your project. Remodeling or renovating your home is an exciting project. It can also be stressful if you don’t find the most qualified home improvement contractor. If you ask the right questions before you hire a contractor, you can be well on your way to a successful project outcome.